This is a very special sweet adored by all my family members. My mother-in-law was a specialist in preparing this dish on all festive occasions. My nephew loved to relish this sweet prepared by his dear Pati. She did not mind all the laborious steps which she had to slog through in its preparation. She happily made two tambalams-ful (very large plate) of the halwa which would vanish in no time. The thought of the translucent and shiny halwa topped with blanched almonds and saffron strands makes my mouth water even now. I had only watched her, and assisted her in the preparation and I never dared to try it out all by myself. Last year my nephew, who now resides in the U.S. visited us for a short stay. I immediately remembered his favourite (and ours!) Godi Halwa, my mother-in-law would have prepared had she been alive now. I pulled up courage and was determined to make the dish myself for my dear nephew. I tried it out by using broken wheat instead of whole wheat. and the mixer instead of the heavy grinding stone. Though the halwa was not comparable to my mother-in –law’s preparation, it had turned out well. 1. Cover the broken wheat with water and soak for two hours. 2. Soak almonds in warm water, and remove the skin. 3. 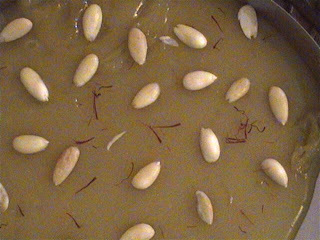 Soak the saffron strands in a little warm water. 4. Grind well the soaked wheat with water, and filter through a mesh to extract the wheat milk. 5. Grind it yet again with some more water and extract more milk. 6. Repeat the process till all the wheat milk is extracted, and discard the solids. 7. Add water, if necessary to make up four cups of wheat milk. 8. Start cooking the wheat milk with sugar in a heavy bottomed pan. 9. Keep stirring to avoid lumps. 10. Once it starts boiling it will thicken very fast. So keep stirring. 11. Add half of the ghee and keep cooking until the mixture becomes like a thick custard. 12. Add the soaked saffron and blend well. 13. Add the remaining ghee and cardamom powder and remove from heat when the halwa leaves the sides of the pan. 14. Pour into a greased plate and decorate with almonds. 15. The halwa will set like a custard when it cools down, and now you can cut them as desired. Store it in the fridge in the plate as it is, and relish piece by piece when ever you crave for it! A note from Dibs: Papu Pati’s godi halwa, is one of the most amazing sweets I have ever had. I would say the consistency of this halwa is between a custard and a jelly. A cut piece will hold its shape, but would be wobbly! Since only wheat milk is used, the halwa is a delicate translucent colour, and the ghee gives it a nice shiny gloss! I really miss my Papu Pati! This post goes to JFI Nov '08 Festival Treats hosted by Srivalli of Cooking 4 all Seasons, as well as Yummy Festival Feast at Pallavi of All Thingz Yummy, as well as Sunshinemom's FIC Brown event at Tongue Ticklers! nice one dibs. A similar halwa is made out of ragi too and we call it halbai. I have never tried with godhi so this is surely on my list. You asked me a tip for Ragi Flour storage, I advise you to buy little at a time. Ragi flour, Jowar flour and Bajra flour (all millet category) change color and taste if they are stored outside for a long time. I store them in freezer compartment. Before using I spread it on a paper, let it come to normal temp or just pour it over warm pan, spread it, leave there for about 5-7 mins and then use it. This way ragi mudde will not have lumps or else cold ragi flour added to hot water is a mess :( This is my own way of using it. I am reminded of my dear mother. Wow halwa looks fabulous...happy advance diwali wishes...keep on rocking..love ur bournvita fudge too..
Never ever tried this, got to this time for Deepavali. Thats so yummy dibs...hope you are sending this entry! Sukanya - yes mega sweet making going on at home! Thanks Happy Cook - try it out! Divya _ let us know how it turns out. Hey Dibs, howdy? Just checked your comment and replied there. Godhi halwa looks yum. I will have to skip this Deeavali without anything but will try and make some Microwave Badami Burfi for kids. I have saved some pataki from 4th of July for Deepavali day for kids too! Hahaha! !